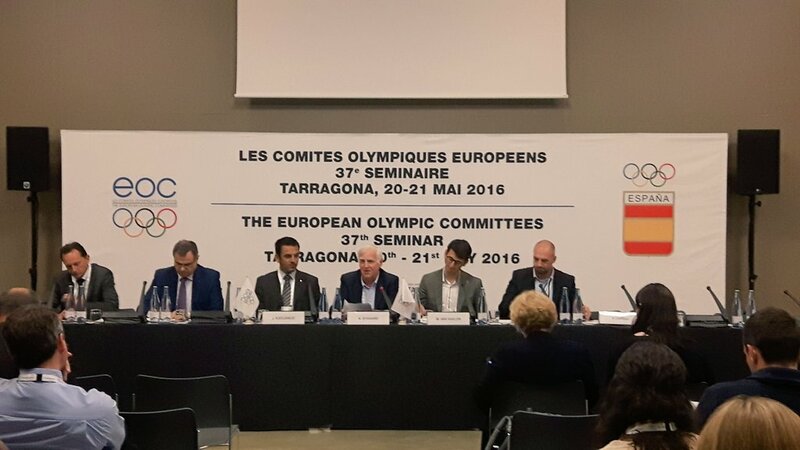 On 20 May 2016, the EOC EU Office organised a workshop on the SIGGS Project within the framework of the annual EOC Seminar for NOCs, which took place this year in Tarragona, Spain. The Seminar presented an excellent opportunity for the EOC EU Office to present the progress of the project and to engage with those NOCs that are not part of the original project consortium. The workshop started with some opening remarks by Janez Kocijancic, Vice-President of the EOC. He stressed the importance of implementing good governance principles stating that Europe should take the lead in setting the standard. Following these opening statements, Matthias Van Baelen and Valentin Capelli of the EOC EU Office presented the IOC Basic Universal Principles of Good Governance as well as the EU Principles, before providing an explanation of the objectives and the methodology of the SIGGS Project. Particular emphasis was put on how the SIGGS Project can support the other 42 NOCs of the EOC outside of the project consortium with as a minimum that the tool will be available for all 50 NOCs and its member federations by the end of the project. Consequently, a panel debate tool place on what are the main challenges for the implementation of good governance at national level. The panel was moderated by Niels Nygaard, Member of the EOC Executive Committee and President of the Danish NOC, with the following panellists: Joao Paulo Almeida, General Director of NOC Portugal, Blaz Perko, Deputy Secretary General of NOC Slovenia, Stavri Bello, Secretary General of NOC Albania, Jean-Michel Saive, Chair of the EOC Athletes’ Commission, and Matthias Van Baelen. Joao Almeida explained how the SIGGS Project helped the NOC to support the implementation of good governance in a very practical way and how the NOC is trying to support the federations. Jean-Michel Saive stressed the duty of the athletes to contribute to initiatives helping to safeguard the integrity of sport and good governance as the credibility and the future of sport is key. During an interactive debate with the audience, various elements were discussed including how legal compliance links with good governance, what the link is with the fight against doping and how to cooperate with the national governments. Niels Nygaard summarised the panel discussion by explaining that a one-size-fits-all approach does not work in the field of good governance. Therefore, flexible tools are needed. This flexibility is one of the advantages of the SIGGS tools as the customised, practical guidance with a 5-level approach is embedded within the methodology of the Project. The idea is to present the final version of the tool at the Final Conference on Tuesday 29 November 2016 in Brussels.